***Our individual condo survived Irma well, being on the 6th floor and having hurricane shutters all around protected it. The Seagulls is rebuilding. The pool and elevators are back in operation. Work on the common areas will continue for some time. This includes the gym and game room. The tennis courts are gone, and will not be rebuilt. Most of the Keys bars and restaurants are back in full operation and some new ones have sprung up. 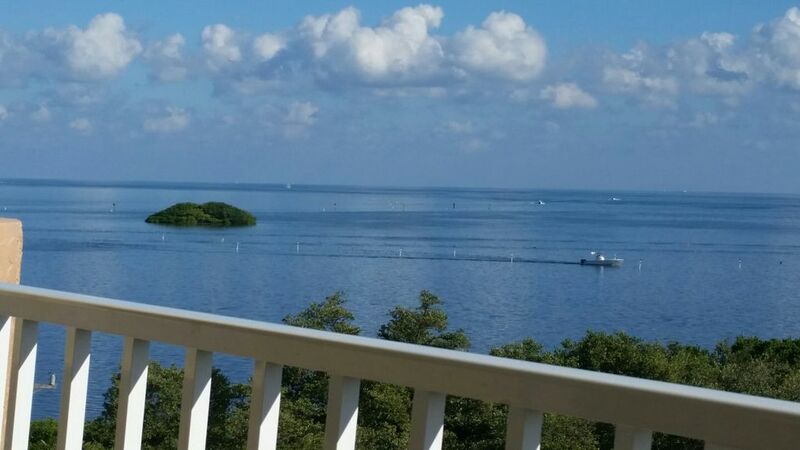 If you're looking for a nice clean oceanview location in the upper Keys, we have it. The area has recovered remarkable well from Irma. ************* Enjoy the unique tropical beauty of the Florida Keys from this end-unit condo. From the private balcony you will see breathtaking sunrises & sunsets. Scan the horizon across the turquoise sea for sailing and fishing vessels, sea birds and dolphins. Spend the day beneath the swaying palms at the oceanfront heated pool or sandy beachfront. Enjoy the complimentary use of our Abaco 135 tandem 13' kayak during your stay. It's perfect for light tackle fishing or exploring one of the nearby mangrove islands. * Kayak seats/ backs are not provided. the kayak can be used without them, but seat backs are strongly recommended. Bring your own kayak seat backs for the best experience. Grab your fly-rod and fish the flats from our private beach. These are the very same flats frequented by Lefty Kreh, Mark Sosin, Jose Wejebe and Flip Pallot and are world renowned for bonefish, tarpon and permit fishing. Your stay will be very comfortable in this Tropically decorated ammenity filled condo with a private bedroom, complete with cable TVCR with views of the ocean and bay. It converts to two bedrooms via a retractable wall in the living room. This accomodates two adults utilizing a queen size sofa bed, and also has a DVD player and offers views of the ocean from the sliding glass doors. In addition to the private bedroom (king bed) it also has two semi private captain's bunks that are just right for kids and teens. It has a fully appointed Carribean decorated kitchen , and dining area, and all the other conveniences to make you feel right at home on your tropical vacation. Coin-op W/D located next to the elevator. The concept of 'Just bring your toothbrush' definitely applies here. Every convenience you could possibly want is here including a frosty central A/C system, and an elevator. For your entertainment there are two TVs & books. Smoking is prohibited inside the unit. Payment can be made via credit card directly through VRBO. Conveniently located at 200 Wrenn St. on the ocean opposite Coral Shores HS athletic facility. Wi Fi is available privately in the condo and publicly in by the pool. Please visit our calendar at the bottom of this page to view our inventory of newly available weeks. No refunds for cancellations unless a replacement tenant is booked. No refunds are offered for multi week and monthly rentals. We are private owners and cannot afford to take weeks out of inventory. If you need to verify LAST MINUTE availability, I can be reached by phone. I have owned this property for 16 years. It's beautiful in Islamorada. The view from the balcony is great. We love to fish, dive, dine out and visit areas of interest unique to the Keys. It's in the Keys! What else is there to say! Gorgeous ocean views from your own private balcony. View of H.S. sports field across street. Use of common areas, including pool, is permitted under the rules of the condo Association. WiFi is available at the pool and also inside the unit.